Harley-Davidson® motorcycle jacket accessories include body armor and body armor replacements for the most comfortable ride. The New MICRO-LOCK Air back protector L2 is the softest and most comfortable Knox back protector ever made and totally contours to the body. CE certified to the Motorcycle Back Protector Standard EN1621-1 – 2014 Level 2. Knox MICRO-LOCK uses SMART technology and properties to keep the armour super soft to touch but it locks when impacted. The locking action increases the amount of impact absorbed by the back protector and reduces the energy passed through to your back. A soft stretch cover on the outside. Breathable Y Air channels combines with British made spacer fabric for multi directional air flow. Soft adjustable waist belt with additional integrated kidney protectors. Side straps adjust for an individual secure fit. Harley-Davidson® EN 1621-1 CE-approved body armor. 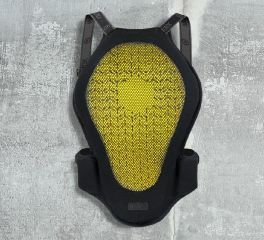 For use as men's shoulder protector or women's elbow/knee protector, certified CE Level 1. Harley-Davidson® EN 1621-1 CE-approved body armor for use as men's elbow or knee protector, certified CE Level 1. Harley-Davidson® EN 1621-2 CE-approved back body armor. Designed to fit Harley®-Davidson jackets that contain built-in pocket for the Tri-Layer Back Armor only. This lightweight back body armor is designed to absorb energy from an impact without compromising on comfort, ventilation or freedom of movement.